The Everyday Family Chore System Review!! I am a stay at home mom and wife (aka Homemaker) by trade and I am always excited to find new resources that help make my life and “work” easier. Everyday Homemaking is just that- a wonderful resource full of valuable information and sanity saving tips. Vicki Bentley, the voice and experience behind Everyday Homemaking is a veteran foster mom of over 50 and grandmother to 15 (with more on the way). Together with her husband, Jim, they have successfully homeschooled more than 17 children as well as been active in the homeschooling arena for years. With so much wonderful experience, it’s no surprise that the “Practical Ideas for Busy Families” as toted on the website are so rich with information and encouragement as well as practical enough to put to use in almost any family situation. 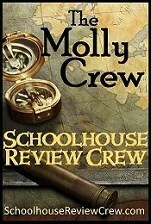 For this Molly Crew review, I was given a copy of Everyday Homemaking’s- The Everyday Family Chore System– a much needed resource in our home! With the arrival of our new little guy a few months back and our recent cross country move, things in our home have been hectic to say the least. Our past chore system was no longer working and we desperately needed to infuse new life into our organization and homekeeping schedules. The Everyday Family Chore System was just what we needed!! There have been many days in the last few months when I have felt that I just didn’t have what it takes to keep up with the children, their schooling, our home, the menu, the chores, it all has been a bit overwhelming. After reading the first few pages of this great new resource, I was tempted to call Vicki and ask her to come move in with me for a few weeks and teach me how to do it all. Her voice in this book is so encouraging and peaceful that within a few pages I actually began to believe that it might be possible to get a handle on our mess. I love that Vicki begins by introducing herself not as a “child rearing expert” but as a “well-practiced mom” who by the Lord’s Grace has been able to be a blessing not only to her 8 biological daughters, but to so many additional children (and teens). Throughout these three parts, Vicki clearly lays out a plan that will motivate and encourage you to not only create a plan that works for your family, but also gives valuable information about how to implement it and how to keep your children motivated to stay on track. The Everyday Family Chore System is so reasonably priced as well- you can purchase it on the Everyday Homemaking website for $19.99!! – I love that this isn’t just your standard cut and paste “pick your chores” system, but truly a resource that takes you from before you begin the plan all the way through implementation and beyond. – I love that in the very first few pages, Vicki explains that creating a successful home making system does not come from having the perfect plan, but from teaching your children the value of serving one another in the family- and God. When you are able to make this the foundation of your home- all the other pieces fall into place much easier. – I love, love, love the “Four basic principals” of child rearing that Vicki shares- the two most important of those to me encouraged me to reevaluate my expectations of my children, in some cases they were way too high and in other cases- much to low, and a sweet reminder to parent with love and grace “tying strings” to our children’s hearts. – I love the “Life Skills Checklist” included in part 2 of the book- it easily breaks down by age the tasks that most children are able to complete either by themselves or with supervision. This really assisted in the reevaluation of my expectations as well. – I love the step by step method this book takes in showing how to set up a system for your family that will allow for the highest level of success. – I love all the tips and tricks shared throughout this book to make homemaking easier. – I love the reminders that while we are teaching our children valuable skills, we can also learn things ourselves that makes life easier. We are all works in progress and we as parents need to model that which we want our children to become. – AND I LOVE- the How to do it cards- these have been just the jewels I have been looking for- such an important addition to our lives and they have truly made my job as mom and “home maker” so much easier. So- as you can probably gather, I love this book!! It has been such a great resource and encouragement to me just when I needed it most. I would love to say that our household is perfect now and things run smoothly everyday, but that would not be reality. What I can say is that I have a renewed excitement for my “job” or “blessing” as a homemaker and our home has much more peace and joy as a result of using this system. It truly has been a blessing to us!! Disclaimer- I received no compensation for this post. I did receive one copy of The Everyday Family Chore System at no charge to assist in my writing this review. The opinions in this post are mine alone and were in no way influenced by outside sources. That’s interesting. I might have to try that out. Chores around here are a nightmare. I am still trying to figure out a chore system that works for our family!